I didn't unpack my Christmas boxes to find my own pine cone ornaments just borrowed a picture to show what I am not putting on my tree. Vintage is very popular - and these ornaments store in such a small amount of space when not on display. Bonus. Green, re-using, re-purposing, re-cycling. I had a thought last night about re-purposing. The current trend of cottage decorating, of finding and restoring furniture and items from the 30's through 60's, of framing ephemera, playing vinyl, dressing from the past is coalescing. I took a picture of the green frog ashtray. It is authentic with a burn on the base from cigarettes (dad smoked 'roll your own' and cracks on the head from all the kid years. The salt and pepper hen and rooster were mom's too. 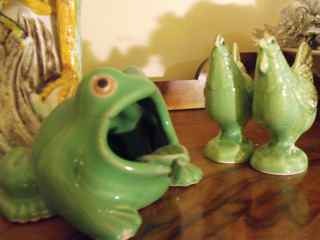 The color is late 40's - if I could ask mom and if she had any memory she might have said they were wedding presents. When I look around now I see a great deal of green from the late 40's and 50's. I am using that shade of green for painted furniture.